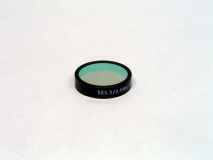 Filter centered at 589 nm, 21 mm diameter, and is 2 nm wide. Filter centered at 770 nm, 21 mm diameter, and is 3 nm wide. 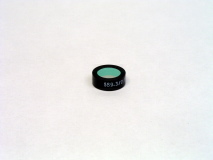 Filter centered at 589 nm, 10 mm diameter, and is 2 nm wide. Filter centered at 770 nm, 10 mm diameter, and is 3 nm wide. Filter centered at 770 nm, 25 mm diameter, and is 8 nm wide. Filter centered at 770 nm, 38 mm diameter, and is 8 nm wide.